Doctors and nurses cover the clinical aspects of patient care, but the people at the front desks and in the back offices are just as important. The U.S. Bureau of Labor Statistics projects a 17 percent increase in employment healthcare management through 2024, as hospitals, clinics and other healthcare organizations turn to strong management teams to handle the business decisions that will both improve patient care and boost the bottom line. Keep reading for more information on getting a degree and finding a job in healthcare management. Pursuing a degree in healthcare management puts students on the path to become an essential leader in the medical field. Students learning in one of these programs will develop essential communication, leadership, and problem-solving skills that will be necessary for successful management of a healthcare facility. The first step to achieving a career in healthcare management is picking your school, which is why we’ve compiled a list of the top programs offered throughout the country. 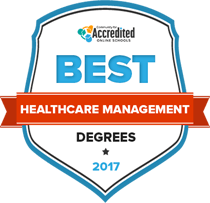 Explore the top-ranking healthcare management schools and programs for 2017 in the list below. Prospective students can find accredited healthcare management programs both on-campus and online. Use the search tool below to find a particular school, or to sort by factors such as location or degree level. The range of opportunities in healthcare management means there is room for individuals with varying educational backgrounds. Those who wish to assume managerial positions will likely need at least a bachelor’s degree in healthcare administration or healthcare management, and many employers prefer candidates with graduate degrees. However, it’s also possible to enter the field more quickly – often as assistants or office workers – by earning a two-year associate degree, and then building experience and getting additional education to progress later. Following are some of the pathways for interested students. Description:A high school diploma or GED is needed to enroll in an associate degree program in healthcare management, which is designed to provide specialized knowledge and career training for students who want to enter the field as clerical workers or administrative assistants, or assume other support positions. Graduates should emerge with a solid understanding of medical terminology, medical coding and billing procedures, and basic leadership skills they can apply in healthcare settings. Curriculum: Curriculum may include both online and classroom-based instruction in areas including electronic medical records (EMR), healthcare statistics and trends, and general healthcare management. Some programs also let students gain real-world experience by completing a practicum at an area medical facility. Students round out their training in healthcare management with general education classes in subjects such as English, mathematics, and social and natural sciences. Students learn the terminology used in medical offices, basic operations common to medical offices (such as billing procedures and insurance processing), and patient communication skills. Provides an introduction to best practices in storing, accessing and sharing medical records, as well as legal and ethical concerns related to health records management. This introduction to the medical coding process may also include the study of common insurance and healthcare programs, reimbursement issues, and insurance processing. Trains students to become proficient in computer use, specifically medical software programs. Description:Bachelor’s degree programs in healthcare administration and management may be completed online, on campus or some combination of the two. They are comprehensive programs of study designed to provide a solid background in healthcare economics, law and ethics, health services management, and healthcare information systems, in addition to general education requirements. A high school diploma or GED, sometimes with a minimum GPA, is required for entry. Curriculum: Curriculum includes general business management courses, marketing and sales fundamentals, organizational communication, and the principles of accounting and finance. Specialized courses beyond the core curriculum may cover ethics and decision making in the context of healthcare, quality assurance risk management, and healthcare economics. A look at the political climate and how various acts, legislation, and policies have historically changed healthcare in the United States, and how things may evolve in the future. Study of traditional management theory, as well as organizational structures in different healthcare environments. Provides a comprehensive review of insurance products and the managed healthcare sector, delivery of healthcare services, and emerging trends in the industry. Teaches essential skills for managing human resources, staffing issues in the context of healthcare, resource planning, and an overview of HR trends in the healthcare industry. This provides the necessary education for entry-level clerical or administrative positions, and serves as a foundation for a bachelor’s degree. With knowledge on the foundations in healthcare management, individuals are ready to apply their skills in the workplace. This should give them a fuller picture of the industry to see what areas – such as finances or human resources – interest them most. At this level, students may pursue a degree specifically in healthcare management, or opt to get a more general business degree with a healthcare concentration. Graduates should be prepared to first-tier management positions and to advance with further experience. Students aspiring to upper management positions may earn a Master of Public Health (MPH), Master of Health Administration (MHA), Master of Health Services Administration (MHSA), or Master of Science in health policy and management. Many states require healthcare administrates to be licensed. Those who work in nursing care facilities or other assisted living facilities may need to meet additional requirements. Many graduate programs prepare students for licensing exams, but additional study may be required. Healthcare management applies business principles to the delivery of clinical care. The people who work behind the scenes in a hospital, clinic or other healthcare organization make sure that things run smoothly. They may supervise a team of doctors, nurses, specialists, and other administrative professionals to coordinate activities and facilitate cooperation. Other tasks may include handling departmental conflicts, creating and managing budgets, and serving as a liaison between different staff members to help the organization achieve both its clinical and financial goals. Healthcare administrators oversee operations for a medical or healthcare facility. This may involve managing daily activities such as staffing and billing, or, farther up the ladder, creating and implementing organizational policies and making strategic business decisions. Hospital and practice administrators must have strong problem-solving and communication skills, and be competent to take on leadership roles to manage different departments effectively. Hospital and practice administrators can wear many hats, but ultimately they are responsible for leading an organization and achieving its business objectives. They are involved with budgeting, marketing, hiring, and general operations of the facility. Work involves troubleshooting problems, monitoring progress on projects, and resolving conflicts. In larger facilities, administrators typically work as a team, with each individual responsible for a specific department. In smaller clinics and practice settings, the duties of an administrator are often cross-departmental, with work involving conducting meetings with other managers, reviewing budgets, and outlining patient care and employee objectives. Typically, a career in healthcare management begins with managing lower-level administrative staff, handling scheduling duties, and consulting with department managers. After gaining experience, they may be promoted to head a particular department or even an entire organization. Students learn about health information and data management—from disease patterns to demographics—and how the use of that data can impact the operations of an organization. Coursework covers creating effective systems for managing and interpreting data. Focuses on the constantly evolving legislation related to U.S. healthcare, such as insurance reform and privacy obligations, and how they influence procedures and policy decisions in an organization. Students learn the fundamentals of healthcare economics through reviewing the principles of accounting, budgeting, forecasting, and raising capital, all within the context of a healthcare setting. In some cases, students pursuing a general business degree may choose a concentration in healthcare management. They learn to apply general business skills like marketing and accounting to the operations in a healthcare environment. Course topics may include ethics in healthcare, sociology of medicine, and health policy and politics. Increased demand for medical services, especially by aging baby boomers, means that job opportunities in healthcare management should be plentiful. The U.S. Bureau of Labor Statistics predicts the field will grow by 17 percent through 2024, far higher than the average of all occupations. Hospitals employ most medical and health service managers; for those who wish to work outside of traditional hospital settings, other options include nursing and residential care facilities and physicians’ offices. Offered by the AAPC, an association for professional medical coders, this certification is available to those who pass an exam; individuals can learn the material through an associate degree or certificate program specializing in medical coding. This organization offers several tiered certifications, representing different levels of experience, for those focused on revenue cycle management. Targeted to professionals who work with healthcare information, certification requires candidates to hold a bachelor’s degree, have several years of prior experience, and to pass an exam. For individuals who have undertaken graduate studies, this board certification demonstrates advanced skills in administration and is appropriate for those in senior management positions. This organization provides training opportunities for medical coding professionals, and sponsors an industry-recognized certification exam. Professional organization for healthcare administrative management professionals interested in pursuing certification and attending networking events. More than 40,000 members belong to this international society of executives at hospitals and other healthcare organizations. This organization offers resources to workers in health information management, and sponsors a certification program for medical coding professionals. Dedicated to providing education and professional development opportunities for healthcare administration professionals working in all types of healthcare settings. Nonprofit trade association that supports education, networking, and advocacy of third-party administrators, insurance carriers, technology organizations, medical managers, and other groups. Promotes best practices and maintains high standards for all types of patient access services, including call centers, registration, and admissions at patient access facilities.